If you have any questions, or are looking for someone to carpool/roomshare with for this event, please feel free to ask on the Facebook event linked above. CARAVAN NOTE: From this location, we will caravan north on the I-15 to the Valley of Fire State Park (Overton, NV 89040) entrance. Carpools highly advised prior to arriving to the meeting point. WHY DON’T WE MEET AT THE PARK? – First, we need to make sure that all attending hikers have adequate water and snacks. Since there is a Gas Convenience Store (Chevron/Terrible’s) next to the meeting point, this should help anyone who forgets any items. – Secondly, cell phone reception weak or absent in a many parts of the park. So we want to make sure everyone is together prior to arriving to the park. Please note that the second hike will follow right after the end of the first hike. HIKE WALKTHROUGH: For each section, there will be plenty of time for hikers to look around and enjoy the hiking areas. 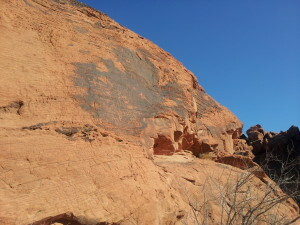 (First Hike) Mouse’s Tank – The trail travels through a long canyon wash and is easy to follow. The trail is, for the most part, very loose sand which makes for difficult walking. Along the way look for petroglyphs on the blackened canyon side walls – some fairly high up. The trail ends at the tank. You can climb a slot up the left side of the tank for views of the surrounding hills and valleys. However, beyond the tank the terrain drops sharply into the valley. The tank itself is difficult to see as it is partially buried in the surrounding rocks. 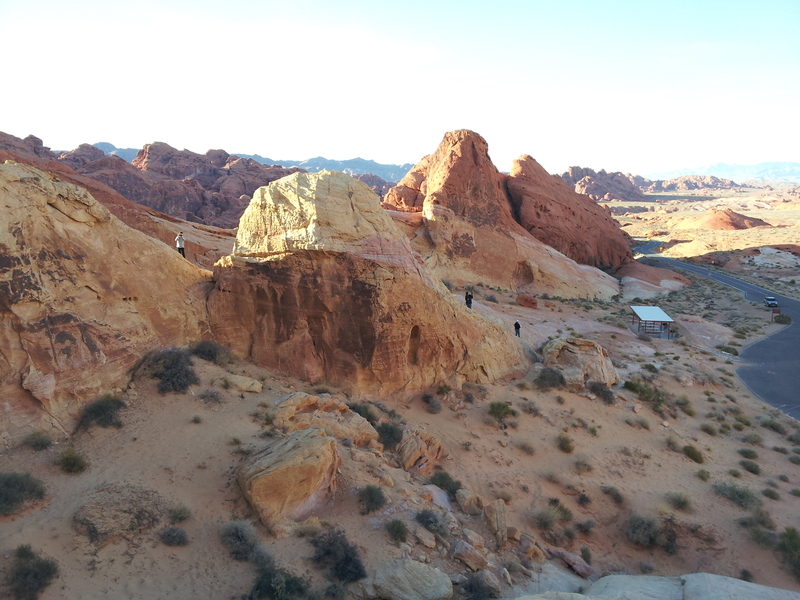 (Second Hike) White Domes – Initially you will be trudging through a lot of loose sand, but just a tenth of a mile into the hike the trail descends with rock stair steps. Another tenth of a mile and you pass the movie set– this was where The Professional was shot in 1965, there is an informational plaque if you are interested in learning more. 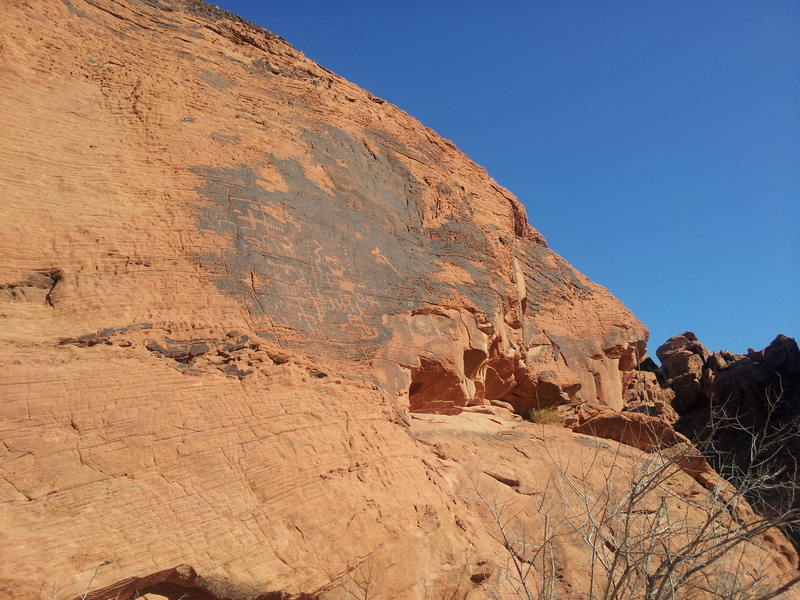 All that is left of the antique movie set is a single wall, but it is still an interesting find, and lends to learning just how many filmmakers are drawn to the picturesque landscape in Valley of Fire. Past the ruin the trail follows a wash and leads into the shady slot canyon, known as the Narrows. The wonders of a slot canyon cannot be accurately described; it is something that one must personally experience. The awe of nature’s power to cut into this robust rock and smooth out the twists and bends will keep you lingering amidst the narrow, cool canyon. DURING INDICATED HIKES: Hikers will be allowed a specified amount of time for exploration during segments of each hike. This means you’ll have some time to do some exploration of the area on your own before we move on together as a group. A high view of the White Domes area. RECOMMENDED: Comfortable hiking shoes/boots, wear light clothing, hiking socks,a hat, SUN SCREEN, backpack or camelpak (hydration pack), small edible snacks, and any additional water. SPECIAL NOTE: Please note that each person is responsible for their own transportation and accommodation. The LA Trail Hikers will not provide anything other than the meetup information for the hike. 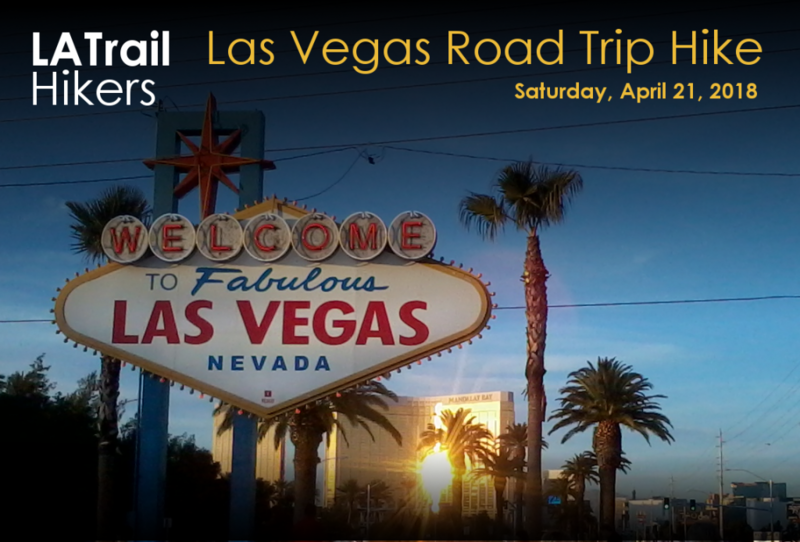 ACCOMMODATION RECOMMENDATIONS: We recommend staying closer to the Las Vegas Strip. That way you’re closer to the meeting point and can easily caravan with the group as needed. Hello everyone! We’re quite excited to have you join us on Saturday for this group hike. And, to have the best time out there, we want to inform you of the following items to make our trip much better. Neon Museum (Boneyard) – ( MAP ) Just north of Old/Downtown Vegas/Fremont St.
— We’ll try to consolidate even more at the meeting point prior to the caravan to the park. — We suggest you getting a good night’s rest on Friday night. — Make sure you have enough for your (cash) entrance fee. — No alcohol during the event. HOW DO I PARTICIPATE WITH THE GROUP ON THIS ROAD TRIP HIKE? 1. Read the Hike’s Details above. 2. Make sure that the Hike Levels accommodates your hiking experience. There are two hikes in this case. 3. Understand that all accommodations and transportation will be the responsibility of each attending hiker. 4. If, and only if it suits you, then RSVP for this event via Facebook and show up the day of the hike with all necessary gear and water (we mention everything you need on the details page for this hike).